The number of providers reported in the COAG Disability Reform Council Quarterly Report for June 2018 represents a 17 per cent increase on the previous quarter. There were a total of 16,755 registered providers this quarter including 2,618 who were new to the scheme. National Disability Insurance Agency CEO Robert De Luca said the figures show the NDIS is gaining momentum as it continues to roll out across Australia. 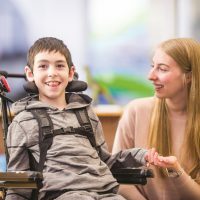 NDIS is now fully operational in NSW, South Australia and the ACT with regions of WA in the process of joining the scheme. “This means hundreds of thousands of Australians are now benefitting from the NDIS and its life changing support, right across the country’, Mr De Luca said said in a statement. The report says a number of initiatives are underway to further grow the market, and the NDIA had implemented a series of additional supports for providers. These include enhancing the provider finder tool and establishing a National Provider Payments Team for providers who are having difficulty making a claim. It is also providing information on the new price guide. The proportion of complaints by registered service providers decreased from 6.5 per cent in previous quarters to 4.8 per cent in this quarter. Speaking at a CEDA conference recently, Commissioner Graeme Head said around 10,000 have been migrated to a national system. The new system is operating in NSW and South Australia and will be in place across the country from July 2020, Commissioner Graeme Head told a Committee for Economic Development of Australia event. Under the national system, the commission will take over registration and regulation of providers, as well as ensuring they adhere to a new code of conduct in which they will have to report incidents including abuse and neglect. Providers in NSW and SA who have moved to the national system have been issued with certificates of registration and informed they will be required to undergo auditing within a specified timeframe in order to re-register, Mr Head told CEDA on Friday. Mr Head said the commission was prepared to come down hard to protect people under the NDIS including banning and deregistering providers.